The Stage Manager is one of the most important jobs at events and festivals. 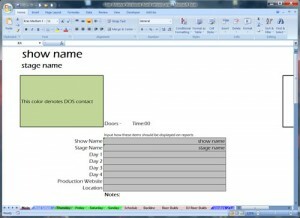 The SM is in charge of ensuring all related parties in a stage production – be it theater or concert – are communicating effectively, on the same page, and able to work together to pull off the performance flawlessly. Looking to become a stage manager or wish to learn more about stage management? Below we have split up the two main types of stage managers and dive into the details for each. The Backstage Handbook – an “illustrated almanac of technical information”, this book is essential for any theater stage manager, and is quite useful for concert stage managers as well. Includes sections on knot tying, pictures of stage related tools, shop math, and much more. For events with speeches, often there will be a teleprompter service set up. Prior advancing of the script and run of show Clear-Com communication with the teleprompter operator is essential in order to keep everything on time. Some events will also have countdown timer software that can be reset at the click of a button every time there is a new cue / speech / script change. Usually a Stage Manager will have an assistant handle this. Stage Managers are normally responsible for ensuring that all cues are executed on time within the predetermined script parameters – but for larger events, this responsibility may fall to a Technical Director, who will coordinate with the Stage Manager, Video Team, Sound Team, Lighting Team, Teleprompter, and Countdown Clock assistant to ensure a smoothly running show. This is a six part YouTube video series that goes in to detail on how to properly production and stage manage in a theater setting. The Stage Manager is the chief liaison between the artists, production vendors, the venue, and /or the festival promoter. Your job is to make sure the artists arrive on time, load-in, sound/line check, play the proper amount of time, load out, and go on their way. 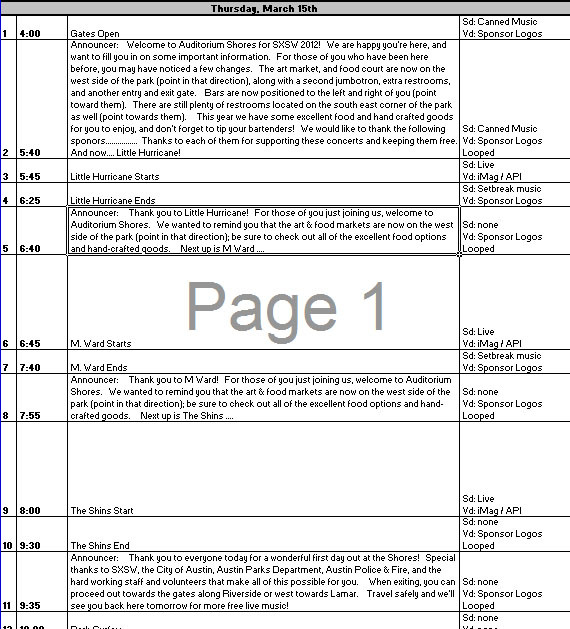 And while they’re on-site your job to ensure all of their needs are met (for larger events, there can be an Hospitality Manager or Artist Relations Manager that takes over the non-production needs of the artists away from the Stage Manager so they can focus just on production). 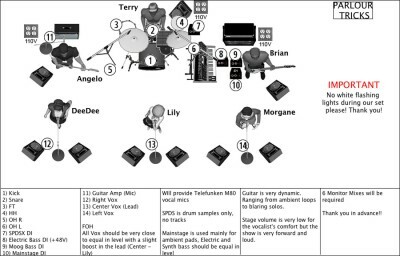 Note it clearly shows where each band member, instrument, microphone, and monitor wedge are supposed to be placed on the stage. It also has a list of inputs for the FOH engineer to base his mix from. Do they need / want an intro? Do they have any merch to sell? Merch policy? Who sells? Split? Where do they set up? Rarely will they have a formal rider with any specific technical or hospitality requests, so the best way to advance is to let them know what production and hospitality you will have for them and see if there are any concerns. They will likely want to bring their own gear, but sharing backline may make more sense if it’s a festival style situation with quick set changes and multiple bands per day. They will usually have light hospitality needs based on their rider, and some may have some specialized technical needs. They may need some coordination with labor depending on how much gear they’re bringing in (some will bring in their own lighting package, consoles, or risers, for example). They will be usually very turnkey and only turn to you for venue related issues / questions. But that doesn’t mean you have less work to do – it’s very important they don’t run into any hiccups because, for example, there’s suddenly no power and the electrician is nowhere to be found. 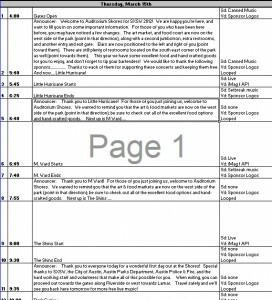 Knowing where your key vendors / players are and keeping track of load-in / run of show / load-out is vital to ensuring a successful performance.